Answer: Engage plenty of prayer support – “our struggle is not against flesh and blood, but against the ruler and the authorities, the spiritual forces of darkness in the heavenly realms” (Eph. 6). Issue: Inspired mostly by guilt rather genuine love or burden for the lost in the heart. Answer: Inspire a burden for the lost – the same love that compelled Christ to the cross, should compel us to reach those outside of His fellowship. Issue: People think its someone else’s responsibility and past evangelism efforts have not “resonated” with their own experience. Answer: Help people identify their gifting in respect to the conversion process and discuss reasons past involvement was not fruitful to help debunk myths and soften the demonizing of outreach efforts. Issue: Wrongfully defining what evangelism is so that much is done in the name of evangelism but doesn’t really engage unbelievers. Answer: Help people to work through a practical and biblical understanding of what it means to actually engage those outside the faith and further a dialogue about the meaning of the word and how it is applicable to their everyday life. Issue: Dearth of evangelism is most likely the result of the four letter “fear” word – which is rooted in ignorance, doubt, and unbelief. Answer: Sponsor a Sharing Your Spiritual Journey With Others seminar, workshop or small group in your church and promote it for months in advance from your pulpit. Issue: Pastors and board members are noticeably absent during evangelism training and outreach efforts. Answer: The pastor is in a unique place to lead the flock by example and if they see him or her involved they will likely follow suit. Issue: A lot of fuss and bluster but fizzles out for lack of proper venues even when people are motivated. Tied into ignorance of how they can best be utilized in ways that resonate with their gifting and experience. Answer: People need on-hands mentoring to get them over the initial hurdles of fear and need to see some positive fruit from their efforts in some way. Issue: Follow-up and assimilation programs are not fully in place to help preserve the harvest God gives you. Answer: Identify who is gifted in this area and empower them to implement a comprehensive matrix of small groups, meetings, and teaching for new converts and seekers – learn more about the Steps To Establishing and Assimilation Ministry. Issue: People don’t see sinners converted and therefore assume no real evangelism is taking place. Answer: Help those involved understand how their efforts help the whole conversion process and how that fits within what is God is doing in the Kingdom of Heaven. 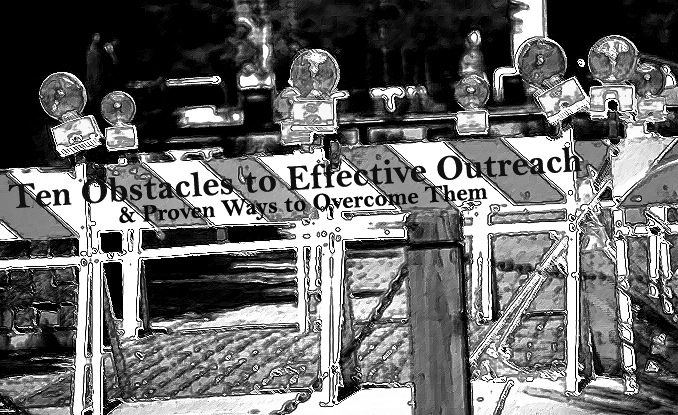 Issue: Evangelism outreach, materials, and staffing often takes second place to programs that “feed” the saints, rather than reach out to “others.” Evangelism efforts are placed in conflict with other ministry opportunities thus providing an “out” for some that might otherwise be involved. Answer: Make evangelism training, outreach, and followup a budgetary and calendar priority, giving it plenty of resources in money, time, and talent to make the outreach a genuine success.